I am pleased to share with you that the new Principal for St Andrew’s Junior School, Singapore has been announced, with the appointment taking effect from 15 December 2010. 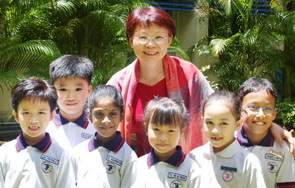 The new Principal is Mrs Wong Bin Eng, currently serving as Principal of Tampines Primary School. Mrs Wong is a visionary principal who has taken her school to greater heights in her 7 years there. Tampines Primary School is one of the few primary schools in Singapore which have garnered the School Distinction Award, as well as the Singapore Quality Class Award. Her work in Staff Well Being and Staff Development is well recognised, and this has garnered awards like Work-Life Excellence Award. Mrs Wong is also very concerned about character education. She was able to lead her school into obtaining the Outstanding Character Development Award as well as the Development Award for National Education during her tenure. Staff development is another area that Mrs Wong has had extensive experience in. She has led her school and staff in various staff development efforts, developing a Poetel Framework that has been extensively shared with schools in Singapore. Her school obtained People Developer Standards in 2007 and was re-certified in 2009. I am sharing all these achievements with you to let you know how eminently qualified Mrs Wong is to lead SAJS. She will bring with her extensive experience and beyond that, a passionate heart for providing quality education for our children. On a personal note, Mrs Wong was my classmate when we were all principals-in-training. She has always struck me as being someone who is mission-driven, being a strong and committed Christian, and having a unique mix of head and heart in the way she manages people. Mrs Wong is looking forward very much to join SAJS and to understand the school. I have shared with her that she cannot get a more supportive group of parents than our SAJS parents who will warmly welcome her, and give her every encouragement to lead the school `Up and On’! May God continue to bless the school as the baton passes from one principal to another.